I’ve lived in Ecuador for five years now, and while I enjoy the slow pace of life, the surrealistic vistas, and the perfect weather every day of the year, I’ve also come to love the country’s culture of celebration. Nearly every week brings some type of event somewhere in the country. Many festivals are small and localized, but there are also a good number of larger festivities. If you can’t attend them all, you should at least try to make it to one of the following. In a country whose population is more than 90% Roman Catholic, religious holidays are a big deal. Semana Santa is the Holy Week leading up to Easter. During this week you’ll find fanesca being sold at local restaurants and even out of private homes. This soup is only made once a year and traditionally contains salty fish, hard-boiled eggs, and 12 different types of grains and legumes which represent the 12 apostles. On Good Friday there are hundreds of processions of devoted Catholics throughout the country. 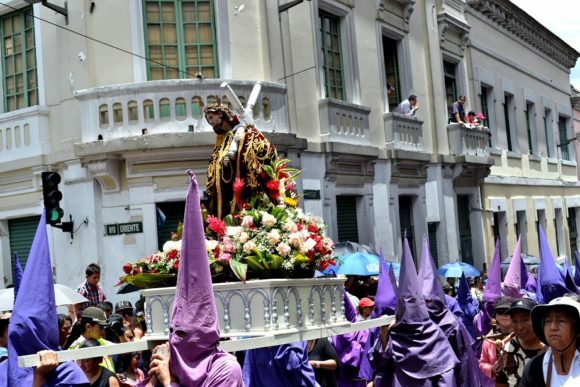 In Quito, penitents make a three-mile journey through the historic district while dressed in purple robes or carrying wooden crosses. It is an astounding sight that shouldn’t be missed. The Incas had a long love-affair with Inti, their sun god, and he plays heavily in much of their culture. Today, a festival devoted to Inti still takes place throughout the Andes and is known as Inti Raymi. The town of Cotacachi has the largest Inti Raymi celebration and it is held in late June during the summer solstice. 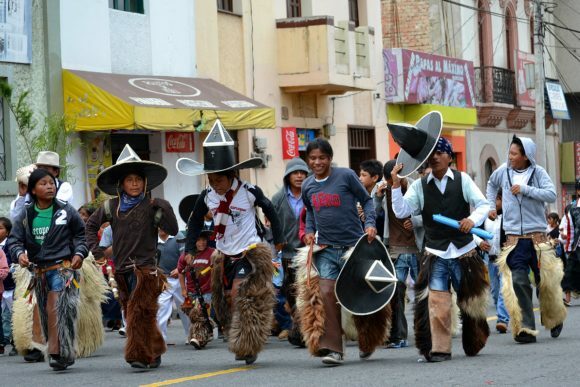 Lasting over a week, this festival sees residents of the nearby indigenous villages march into town dressed in black pointed hats and goat-skin chaps. They gather at the town square and dance, chant, and blow conch shell horns. 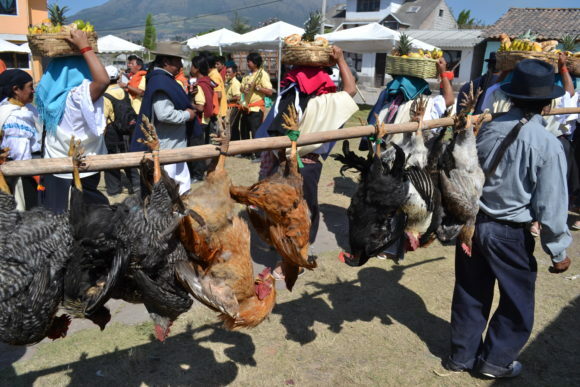 Most spectators prefer to watch in the early afternoon and then head over to the many food stalls set up behind Cotacachi’s main church for dinner. 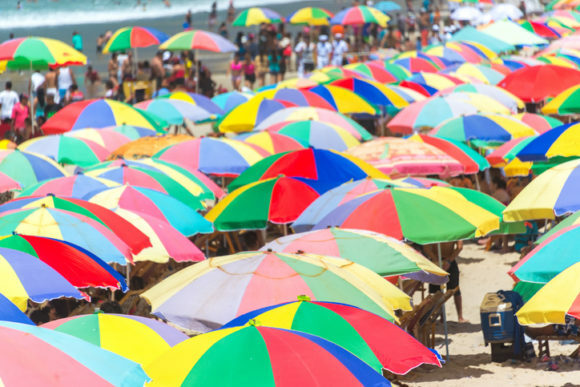 While Carnival in Ecuador is not the spectacle that you’ll find in Rio, it’s plenty of fun in its own right. As Carnival takes place just before Lent, it’s a last chance for many people to get in some good old fashioned fun before the more sobering religious time of year. Children run through town targeting passersby with foam that sprays out of a can or water from squirt guns. Mischievous teenagers might use a hose or a bucket to wet down their neighbors. It’s all in good fun and revenge is highly encouraged. In the cities you’ll also find concerts, parades, and fairs designed to provide family-friendly entertainment. 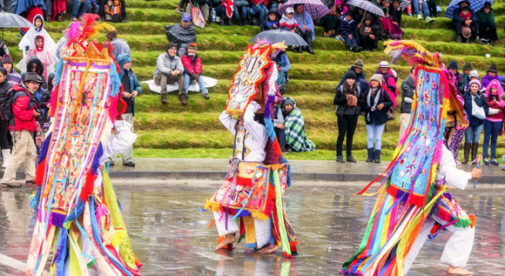 Tarpuy Raymi is celebrated by the indigenous cultures of Ecuador’s Highlands and occurs just prior to planting time in September. The annual rains are about to begin and the locals use this festival to pay homage to the earth and ask for a good growing season. Most communities have three days of dancing, musical events, and socializing. Of course no party in Ecuador is complete without an enormous buffet of food, so you’ll be treated to chicken and vegetable soup, pulled pork, potatoes, hominy, corn, and much more! Dia de los Difuntos is Ecuador’s version of the Day of the Dead and runs from late October to early November. However, if you’re thinking it might be a spooky or macabre event like Halloween, you’d be wrong. This event is an opportunity for folks to honor and remember their loved ones who have passed on. 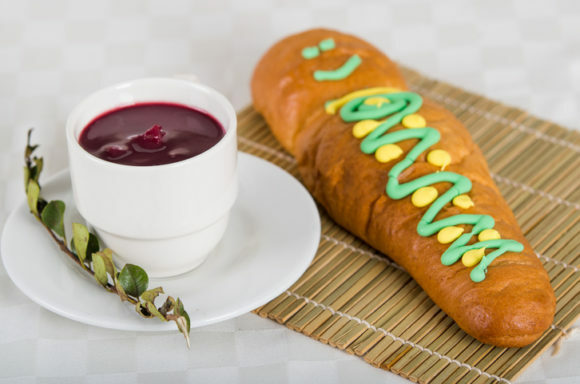 Families prepare bread in the shape of babies and colada morada (a thick fruit-based drink) along with other treats and picnic at the graves of their ancestors. Families will often invite their expat friends to come with them and experience this tradition along with them.